Ten Nine Eight tells the story of a daddy trying to put his little girl to bed. 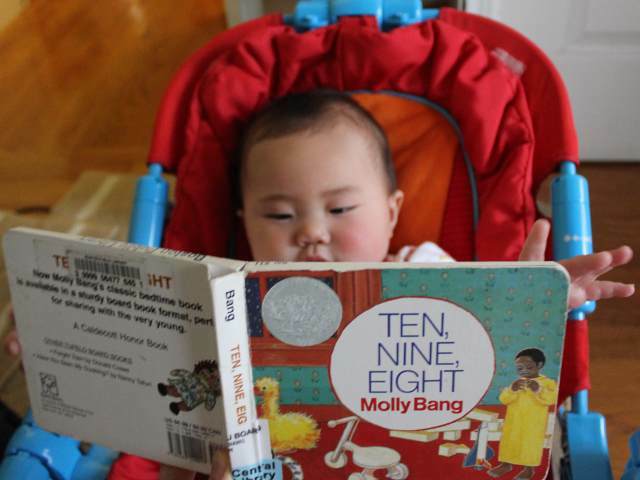 Unlike with other counting books which just present related items with no larger context, readers of Ten Nine Eight can watch the father trying to get his daughter to go to sleep. In order, readers see: ten toes, nine stuffed animals, eight windowpanes, seven shoes, six seashells, five buttons, four sleepy eyes, three kisses, two strong arms, and one tired girl. The illustrations are plain with a natural style, but they make viewers feel the warmth of a loving home. Arya liked the bright colors on the drawings which included the carpet, but she didn’t particularly care for the other pictures. Text is limited to a short sentence description the items shown on each page. Since the pictures often have far more detailed than is listed in the text, readers will have to focus on a specific element of many images to find the corresponding number of items. The simple trick of reversing the counting order from ten to one instead of from one to ten makes a big difference in the appeal of Ten Nine Eight. By counting down the book sets a tone for finality and makes it a good choice to read to children as a nightly bedtime ritual. Older, school-age children will like seeing the girl go to sleep as they get ready for bed. Younger readers will enjoy the counting aspect of the book. Babies may not be as interested in the book as with some others with more colorful and interesting pictures. Ten Nine Eight costs (including shipping) under $7 new and under $4 used from Amazon.